Abby Kelly ’19 in a game against Amherst earlier this season. 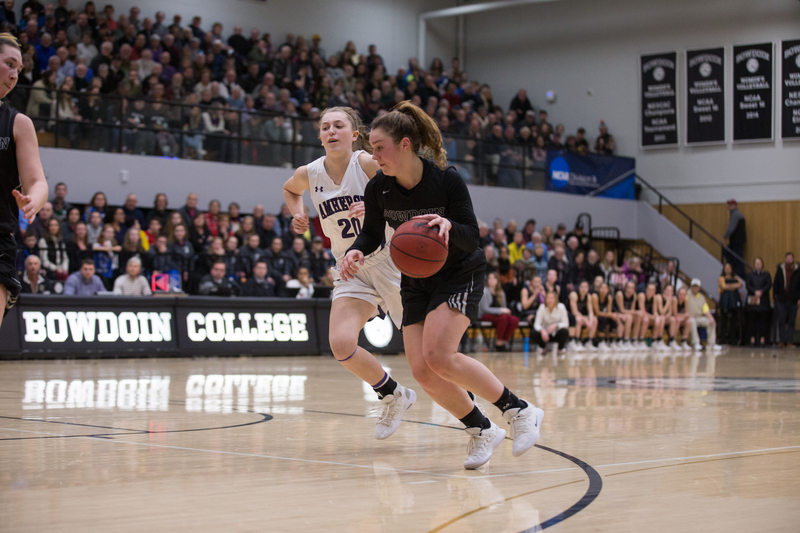 For Bowdoin women’s basketball (20-0, NESCAC 6-0), the story of Saturday’s 65-56 victory over the Amherst Mammoths (17-2, NESCAC 4-1) began 315 days earlier in Rochester, Minnesota. It was there, in the Mayo Civic Center, that the undefeated Mammoths finished off the Polar Bears, 65-45, to earn their second consecutive Division III National Championship title. It was there, with confetti falling at their backs, that Bowdoin left Amherst behind. Meeting the Mammoths for the first time since that March evening, this time on their home court, the Polar Bears were determined to end things differently. So, too, were the throngs of white-and-black-clad fans who packed Morrell Gymnasium to fire-code-threatening volumes to see the rematch of last year’s championship game. Colby-Bowdoin hockey game be damned—this was the game of the weekend—hell, of the entire winter season. It was certainly the climax of what has been a season of nearly unprecedented success for Head Coach Adrienne Shibles’ squad. Following Saturday’s win over Amherst and a victory over Hamilton (10-7, NESCAC 0-5) this past Tuesday, the team improved to 20-0, only the second time in program history and the first time since 2003-4, it has reached that milestone. These games aren’t nail-biters, either. The Polar Bears average 85.2 points per game to their opponents’ 50.4. And the nation has noticed. On November 27, Bowdoin was ranked number one in DIII polls, dethroning—who else?—the Mammoths. It has remained atop the polls since. Winning, as it happens, is an infallible recipe for success. Which isn’t to say that Polar Bear basketball is a newcomer to the limelight. During Shibles’ 11-year tenure, the Polar Bears have gone 243-63 (.794). Shibles’ predecessor, Stefanie Pemper, now the head coach at the U.S. Naval Academy, went 235-48 (.830) over her ten years. Bowdoin won the NESCAC championship for seven straight years between 2001 (the inaugural tournament) and 2007 and hasn’t posted a losing record since 1993-4. Yet the Polar Bears also haven’t taken home a NESCAC title since 2009, Shibles’ first season as head coach, when they beat—you guessed it—Amherst, despite reaching the championship game in 2011 against—there’s a pattern here—Amherst and again in 2015 against … Tufts. Bleh. Yet midway through Saturday’s engagement, things were looking bleak for the women in black. Vexed by the Amherst defense and outgunned by its offense, Bowdoin headed to the locker room trailing 18-34, having shot only 20 percent in the half. In the locker room, the players, not the coaches, lit the flame that would unfreeze the Polar Bears’ game. And the second half was a veritable Bowdoin basketball clinic: 20 thrilling minutes of up-tempo, composed, gutsy ball. Relying on a brutally effective press to jam up the Amherst offense, the Polar Bears outscored the Mammoths 28-10 in the quarter, taking the lead on a layup by Sam Roy ’20 with 2:33 left in the third. The stands of Morrell shook. The Polar Bears kept rolling through the fourth quarter, carrying a 19-12 advantage to hold off the surging Amherst offense. Kelly led Bowdoin with 19 points, followed by 14 from Maddie Hasson ’20 and 13 from Roy. Besides being one of those mesmerizing, this-could-have-been-scripted displays of athletic dominance and good old-fashioned chutzpah, Saturday’s win moved a couple of crucial pawns into place for the Polar Bears’ long game. 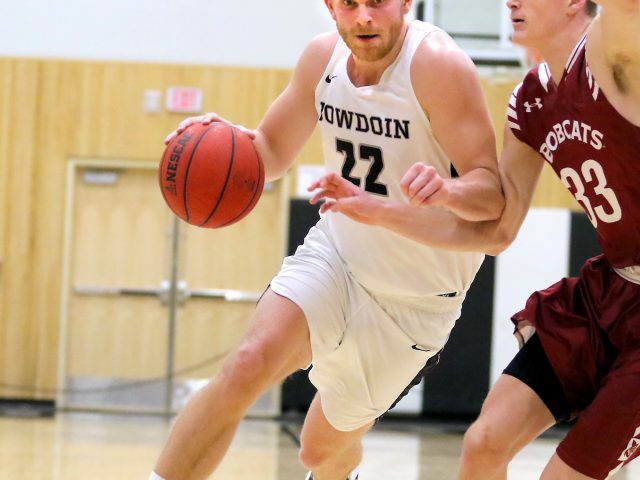 First, Bowdoin became the likely favorite in the NESCAC playoffs, distancing themselves further from Amherst and all but securing home-court advantage in the postseason. Rejoice, fans, for the fun is only beginning. Second, it sent a timely message. 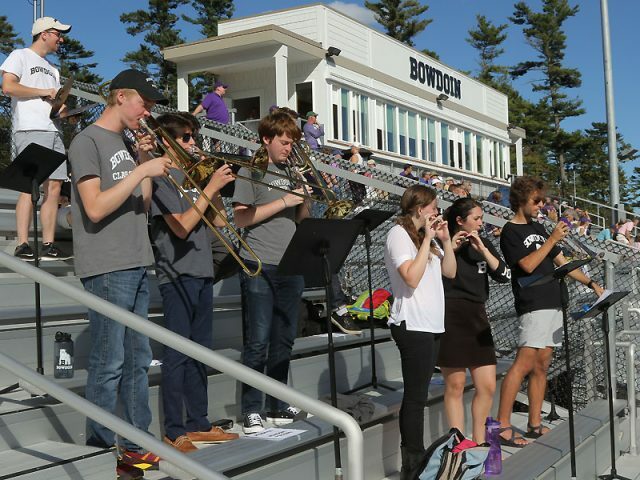 When the early-season rankings placed Bowdoin on top, above Amherst—mostly the result of a fluke Amherst loss to Eastern Connecticut State—Shibles was uneasy. “We haven’t earned this,” she said and worried that it would sidetrack the team from its development. But after Saturday, there is little doubt: Bowdoin is number one, and they deserve it. 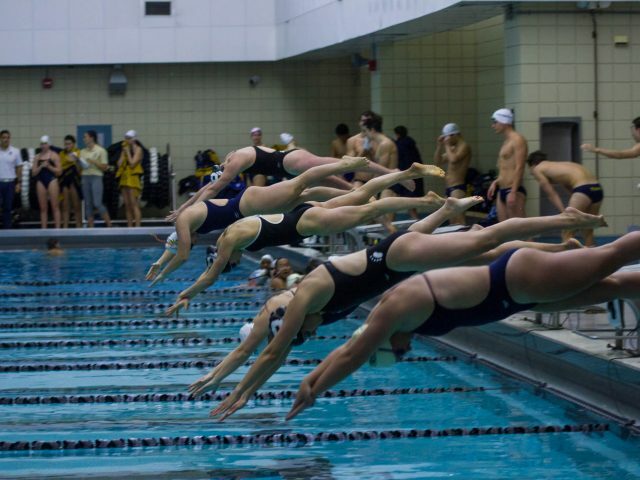 “[We made] a statement to the nation, to ourselves, to the other team, [to] all the other teams in the NESCAC that we’re here and we’re Bowdoin,” said Kelly. 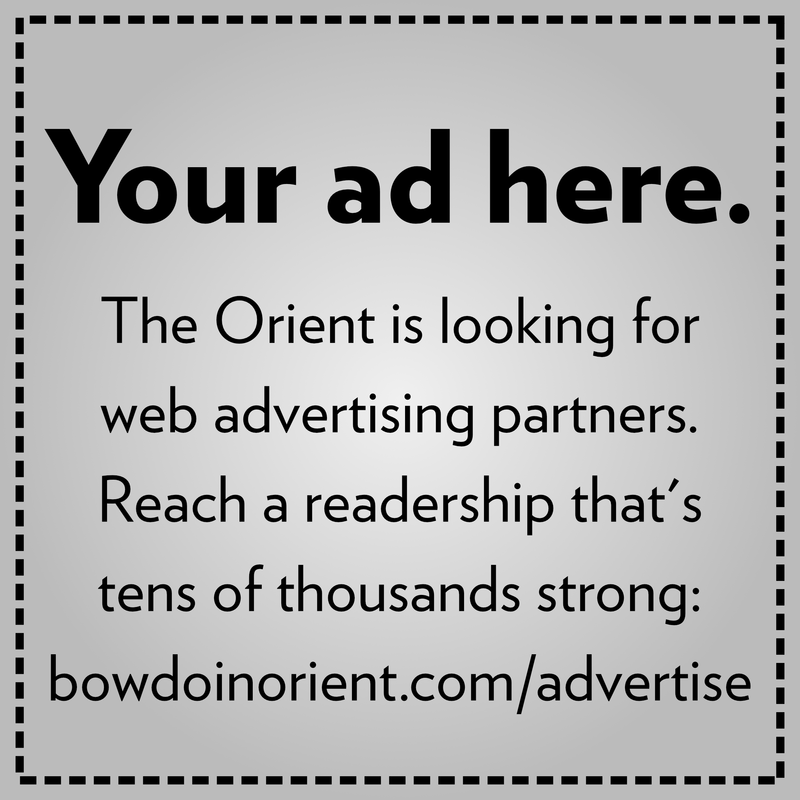 And Bowdoin is really, really good. The reality is that Bowdoin’s women’s basketball is almost certainly the best DIII basketball team in the nation. With the exception of men’s tennis, no other Bowdoin team can claim such prominence on the national stage. Moreover, the Bowdoin-Amherst rivalry is emerging as one of the most fierce and exciting, certainly in the NESCAC, if not in DIII ball altogether. Which is all to say: if you’re not paying attention, you should be. Don’t look now, but with only four games remaining in the Polar Bears’ regular season, redemption, it seems, is nigh. I always called Morrell, the Morrell Madhouse, though mostly that was out of jest because most games for both the mens and womens teams were generally quiet affairs. But I knew that the gym has the potential to have an amazing atmosphere, and I’m glad it was like that last Saturday. The ability to be right on top of players in the bottom section is so great I’m not sure if it should even be allowed honestly. A good basketball atmosphere beats a good hockey every time in its ability to affect a game and be an incredible experience for the crowd itself. Ian, I really enjoy reading your takes on Bowdoin sports and look forward to more.